Journalist and author Natalie Moore is a Chatham native who covers the South Side for WBEZ. She's spent years reporting on many of the issues that divide and define Chicago: race and class, segregation and housing. Her new book is a memoir, an investigation and a nuanced look at neighborhoods she says are often misunderstood. When Moore was a teenager, she was riding the “L” back to the South Side and was taken aback when the white folks hadn’t all exited the train by Chinatown. After the train hit the 35th Street stop – Comiskey Park – the train cleared out, and the white passengers made sense. In her new book “The South Side: A Portrait of Chicago and American Segregation,” Moore blends moments big and small from her own history with the history of the South Side to show how segregation affects Chicago to this day. Photos from Moore's new book "The South Side"
Moore says it’s not an academic book, even though it’s steeped in research. It’s also steeped in her experiences living and working on the South Side, and seeing it as more than the violent war zone often depicted in news media. The book looks at the wide variety of neighborhoods on this South Side with a fondness for their individual qualities, but also a journalist's eye for the ongoing challenges policies of segregation create for residents. 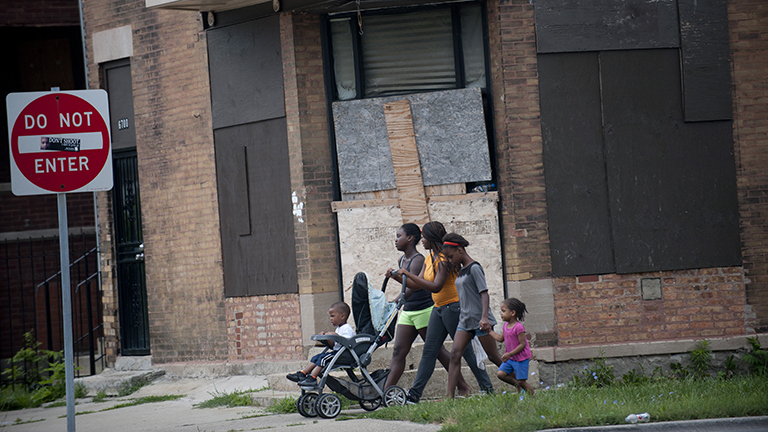 Natalie Moore (Photo by David Pierini) “The issues that Chicago is facing are not unlike the issues facing other cities, particularly in the Midwest or Northeast. Crime is not something Chicago has dibs on. Public education is a big issue. Quality of life. Income inequity,” Moore said. From her perspective, Chicago gets national focus as it relates to these issues – especially violence – for a range of reasons, not least of which is that President Barack Obama is an adopted Chicagoan. But she says while the issues aren’t unique to Chicago, they can be instructive for both locals and out-of-towners. Nov. 30, 2015: Geoffrey Baer has shown us Chicago from the river, the lakefront and even the “L." Now he’s heading south to explore the unique culture of South Side neighborhoods and share stories from the people who live there. Oct. 21, 2015: Some landlords in the Chicago area are illegally discriminating against Section 8 voucher holders, according to WBEZ. Does this highlight problems with the program itself or is it blatant racism?